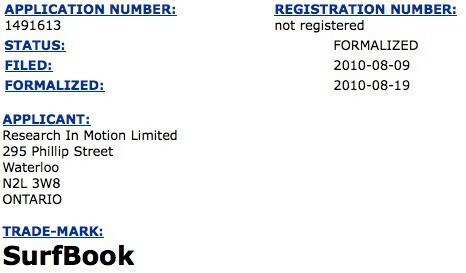 RIM applies for the "SurfBook" trademark - possible name for their tablet? It's hard to say at this point if manufacturers out there will be able to get tablets out to the market in time for the upcoming holiday season, so it's going to hinge on timing when they make official announcements. We've been hearing about RIM's take on the tablet form factor, the BlackPad as we recall, but that specific moniker might simply just a codename. Now it appears as though we might be having a clear cut indication to the name of the still rumored tablet that RIM is apparently working on. Back in early August, RIM filed for the trademark name of “SurfBook” which sounds like a device fitting for a tablet. So far, there appears to be no other documented patents under that name in the US, but obviously it's only coming up in Canada's filing system. Thinking more deeply to the name, one would easily imagine it to be able to surf the web of course, but the interesting part is the book portion which invokes something that doesn't necessarily come to mind with a BlackBerry. So are we going to see a huge focus on reading books with this tablet? umm just because it has the work "book" in the name doesn't mean it's for reading, ie. netBOOK or noteBOOK.